You ensure the business has the services it needs to build and maintain its competitive advantage. You’ve built a career on enabling the business to innovate, while cutting costs. The Turbonomic Hybrid Cloud Management Platform delivers the self-managing apps, clouds, and infrastructure that will elevate your career and your teams. IT is evolving. Old IT was a cost center; new IT must lead the enterprise and conquer the complexity of optimizing costs while assuring performance and accelerating service delivery. Your role as CIO is to increase IT’s visibility and rank as a strategic differentiator to the business, and to architect an organization that can anticipate and exceed its needs. Virtualization increased scale and complexity. With cloud and cloud native technologies, scale and complexity grow exponentially. Scott Crowder, CIO at BMC shares how BMC IT is able to deliver cloud economics in their on premises private cloud with Turbonomic. Given the ever-increasing criticality of IT to the business, the CIO that cannot deliver predictable performance, while minimizing cost will be replaced. Yet a number of trends are increasing the complexity of solving this problem. Moreover, organizations today vary in their level of IT maturity. The ability to adopt new technologies and processes, pressure from the business, as well as the beliefs and aspirations of CIOs all play a role in how and why organizations mature. This document describes five stages of IT maturity for CIOs to understand where their organization is today and where they can aspire to reach. Turbonomic is hypervisor, infrastructure and cloud agnostic. It abstracts any set of compute, storage or network resources into a common decision engine that allows it to control which workloads should run where, when, and under what configuration. The decision engine takes into account all business and architectural considerations or constraints, enabling your team to meet the demands of the business without having to worry about the underlying resources. Using the principles of supply, demand, and price, Turbonomic enables workloads to self-manage, ensuring they get the resources they need to perform. These fundamental economic concepts make autonomic IT possible, no matter what new technology enters the landscape. Learn about all Technology Integrations. Because Turbonomic precisely matches application demand to infrastructure supply, customers typically see an increase in utilization by 40-59%. That means fewer processors/hosts required to run applications and deliver service. Turbonomic also mitigates the costly risk of “lost” VMs with its purpose-built Policy Engine, which makes it easy for administrators to define where VMs are placed. 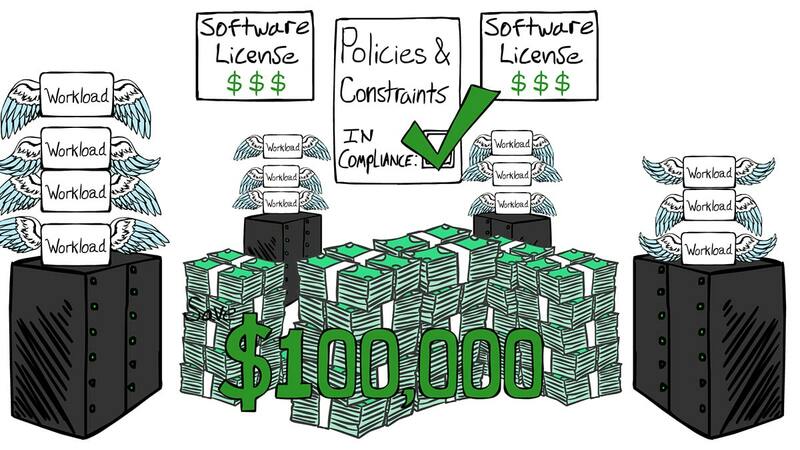 Learn more about reducing licensing costs. David Giambruno, former CIO of Tribune Media and current CIO of Shutterstock, shares how automating Turbonomic helped him build a software-defined data center from the ground up. He collapsed 54 data centers into 7 racks, saving $120 million in 18-months. Additionally, he launched 87 “major” go-lives with no budget or timeline misses. White Paper The Evolution of Enterprise Applications And PerformanceIn this paper, we examine the evolution of enterprise applications, the data centers in which these applications reside & increasing QoS expectations. White Paper Public Cloud GuideLearn about the 3 key elements to consider as you adopt the Public Cloud: Performance, Cost, & Agility. Read the 16-page white paper now! eBook OpenStack for Enterprise: The Tipping Point ComethOrganizations are moving towards OpenStack for the promise of no vendor lock-in, IT agility, and competitive differentiation, not without challenges. eBook The State of Latency, Containers & Microservices eBookLatency, the methods organizations used to mitigate latency, and the designation of latency-critical workloads across industry verticals. eBook The State of Multi-Cloud Part OneJust 10.4% of organizations have a Multi-Cloud strategy. Read this 45-page report to learn the truth on Multi-Cloud in 2016!